==> See section on Lodging. 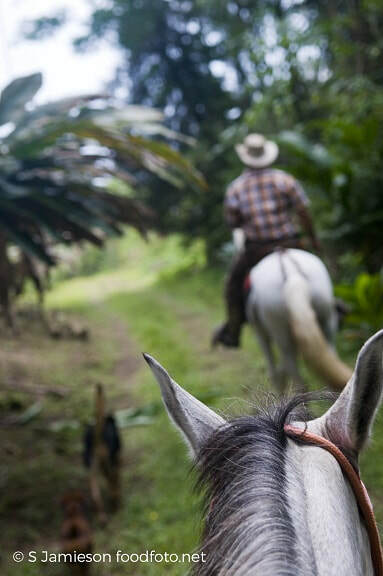 Options of activities include horseback riding, hiking to waterfalls, swimming in natural pools, tilapia fishing, cow milking, farm tour, and just relaxing NOTE: options for a given day depend on weather and other factors. Package #2: 1 Day/1 Night Farm Stay with Activities Options of activities (see package #1), plus lodging and 3 meals. 66,000 colones ($110) per person in house single occupancy, 60,000 colones ($100) per person shared room. 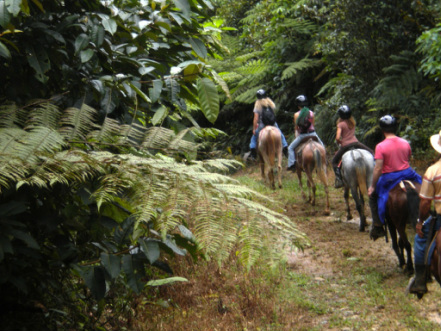 Horseback riding several options are available, depending on rider experience, weather conditions, available time. Note: longer customized rides can be arranged. We also offer horseback riding lessons in our horse arena. Ask about prices for customized horseback riding experiences. 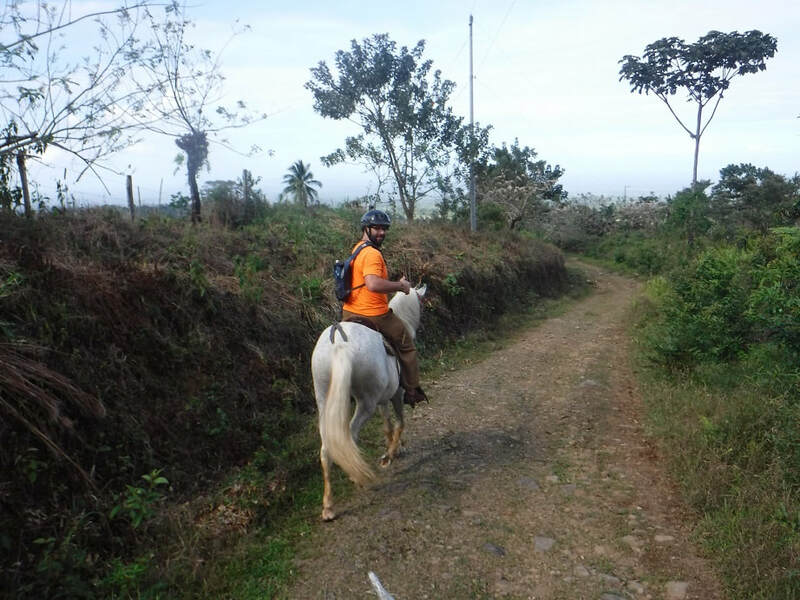 Package #6b: Horseback Riding to Farm Waterfalls: 1-2 hours (ride up the mountain and hike to waterfalls, natural pools, with option for swimming). 24,000 colones ($40) per person including lunch after ride. Hiking: several options are available, depending on individuals' abilities, weather conditions, and available time. 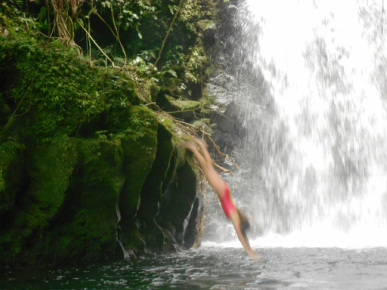 Package #7b: Hiking to Falls and Pools at Macadamia Farm behind Posada Rustica: 1-3 hours => this is an "moderate" walk about 20-30 minutes from the Macadamia House at top of farm. With a guide. Tilapia fishing: 600 colones ($1) to go fishing plus 3,000 colones ($5.00) per kilo tilapia caught. Basic cleaning of fish.=> option: we cook the tilapia. Possible fish only or full meal. NOTE: prices DO NOT include transport to/from Finca Rio Perla, but we can help arrange and/or make suggestions for transport. => Prices DO NOT include 13% Costa Rica sales tax. Visitors should have their own personal insurance. We request advance reservations for all guests. Payment and Refund Policy: Payment: 100% payment within 2 weeks of visit. Refund Policy: 100% refund more than 1 week in advance, 50% refund less than one week in advance, no refunds less than 48 hours in advance. NOTE: exceptions to refund policy can be granted for documented emergencies. Age pricing: under 3 years of age: free, 3-6 years of age: 25%, 6-9 years of age: 50%, 9-12 years of age: 75%, 12 years of age and above: 100%. For 65 years of age and above: 75%. Note: adjustments can be negotiated based on ability/limitations to participate in different activities. Direciones: En Ruta 32 dentro Pocora y Siquirres hay Pista Herediana. Suben 7km para Alegria y despues ponen derecha para Porton de Iberia y San Bosco. Viajen otra 7 km para La Union Rio Perla ("La Perla"). => Hay rotolos por direcion en el camino. montar caballos, caminar a cascadas, nadar en pozos naturales, pescar tilapia. b) Cascadas de La Macadamia 5,000 colones per adulto 15+ anos, 4,000 colones per joven 6-15 anos, y menos de 6 anos libre => Minimo de 2 personas, y discuenta de 10% para grupo de 5+ personas. Dia de Actividades con Comida (4-6 hours): 30,000 colones para persona con opciones de actividades, con almuerzo (o cena) y bocadillas. Dia y Noche de Actividades con Tres Comidas: 45,000 colones para una persona per cuarto, 40,000 colones para persona con dos personas per cuarto Minimum 2 personas. => discuenta de 10% para grupo de 5+ personas. Tour de la Finca (1 hora): 10,000 clones per persona. Programamos el tour por interes de visitante. Con muestras de productos. Minimo 2 personas, y discuenta de 10% para grupo de 5+ personas. Posada Rustica: Noche y Desayuno: 20,000 colones per una persona per cuarto,15,000 colones per persona para dos personas per cuarto. Wifi libre. Check out our lodging page for additional information on our lodging options (and other facilities), and rates for lodging without activities.